García Martín de Calera stems from a Spanish gentry family. In collaboration with film technicians and event planners from Italy, Germany, Great Britian and France, García Martín de Calera hopes to dazzle you with a staged event like no other. Based on the "Organizzazione Carnevalesca de García Martín" they will recreate the baroque stages in authentic style. With love and attention to every detail and knowledge of the importance of props, music and show paired with the right tempo the team works "con amore" to revive the Venice of the old times and to create an unforgettable carnival-ball. [ 4 March 2011 19:00 to 5 March 2011 03:30. ] Welcome to the breathtaking and thrilling night of the incessantly flowing champagne. Become part of this unique imaginative masked ball. 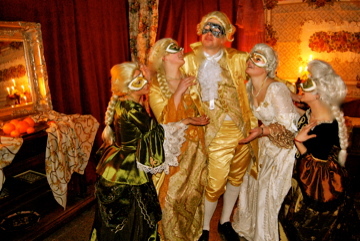 Be invited by Casanova himself and quench your thirst with as much chamgagne as you desire. A night immersed in the champagne-coloured Zenobio Palace, located in the middle of the pulsating heart of Venice.